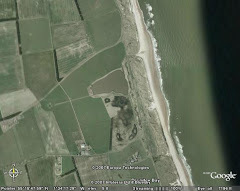 Druridge Diary: Left it late for a full patch tick! I left it a bit late to squeeze another patch tick in this year but a long-billed dowitcher flying around the patch before heading back to its favoured Cresswell pond this morning was a very welcome addition to the patch list. Not the greatest views, I wished I had seen it on the deck, but it still counts. A big thank you to Jonathon Farooqi for the tip-off that it was there. My second patch list addition of the year following September's fantastic red-footed falcon. This takes the patch list up to 238. Jonathon had also found a couple of water pipits on the Budge fields, they were joined by a third for a while. These are the first water pipits I have had on the patch in eight years, the last ones being in front of the Oddie hide and along the haul road. The dowitcher and water pipits take my year list up to 161 species. Not a disaster, but not great. The head shape was right for scaup and the colour looked good. The bird seemed to show some reddish brown on the front and under the tail - in certain light. I still think it is a hybrid - probably scaup x pochard - but it could be a first winter drake scaup in moult. I'll need to have a better look. Well, that's it from me for 2016. Not sure when I'll get back to the patch, but when I do, I hope that dowitcher is there.